To become a truly great city, London needs to exclude most traffic from its central commercial districts. A shopping trip to Stanfords in London set me thinking about what makes a city a truly great place to visit. The heavy traffic, buses, taxis and crowded pavements all feel an inherent part of London’s character. But that very character is also something that makes the centre of London a place that many Londoners generally avoid. It is too noisy, too busy, too congested. London is one of the world’s great cities, and a huge number of people work in the centre, but it is not fulfilling its potential as a shopping, leisure and cultural destination. It is still too dominated by traffic. Many cities have made their centres attractive by excluding through traffic and reducing parking. However, by looking at a large number of examples, a pattern emerges: the low-traffic area is approximately one kilometre across, and surrounded by a ring road. This is the size of the pre-industrial city, with the ring road taking the place of the city wall (or canal). Vienna, Munich, Amsterdam, Copenhagen all seem to follow this same basic pattern. 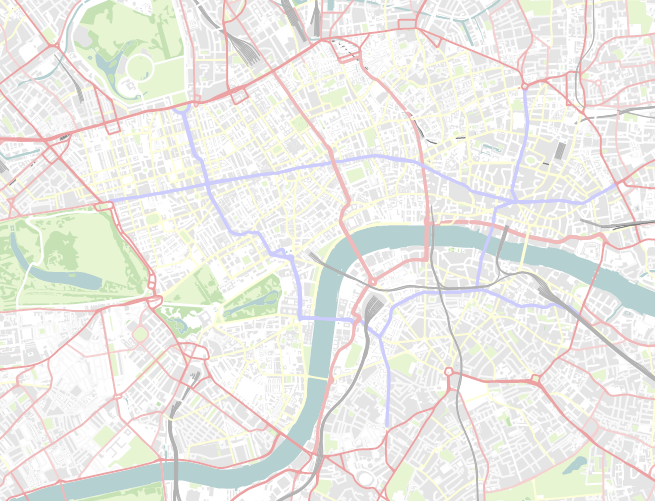 The problem is that central London is much bigger than this, being about 5km by 2km – and that’s excluding the part of the congestion charge zone that’s south of the river. If you try to draw a 1km grid on the west end, you end up with heavy traffic on Oxford (or Wigmore) Street, Piccadilly and Regent Street, which is exactly the unsatisfactory situation we already have. Some of the Italian cities, notably Florence, have restricted traffic over a bigger area, roughly 2km x 2km. This has required a strict ban on private traffic during the day, with limited provision of zonal permits for residents and deliveries. Trying to impose a 2km grid on central London is a bit more realistic. It can mostly be done using the wide roads that the Victorians built: Embankment and Kingsway. The congestion charge zone has been fairly effective, but the lack of control within the zone means that the main commercial areas still have too much traffic. We can do better than that. One observation from the various continental cities is that they typically have very little explicit provision for bikes in the centre. There are often cycle tracks alongside the ring road, but they tend to form a secondary route, with the main cycle routes heading into the restricted zone. The priority for the ring road is to keep traffic out of the centre, not to provide a cycle superhighway. At the moment, London seems to be adopting the opposite policy – of giving the traffic free rein in the centre (for a fee), and trying to carve out cycle superhighways on the few roads that are wide enough. C’est magnifique, mais ce n’est pas la guerre. I’ve drawn a map showing how London might be made into an attractive low-traffic destination. To give access to all areas, three key routes (in pink) would be retained as traffic streets. The rest would be access-only. The traffic would be suppressed by blocking all the other through routes, by pedestrianising the streets in light blue, including Oxford Street and Regent Street. These blue routes would remain bus corridors, but would be much less congested than at the moment. They also make a good set of commuter cycle routes. There would be a few cross routes for taxis, but all other traffic would have to go round.